Schedules are growing more hectic in the Little household with the arrival of the warmer weather. So, once again, I’m turning to my trusty sidekick – the slow cooker – to help with dinner. Lots of folks think of the slow cooker as a cool weather appliance, but I love it for the ease of getting meals ready during the busy time of the year and love that it doesn’t heat up the whole house when it’s so warm outside. 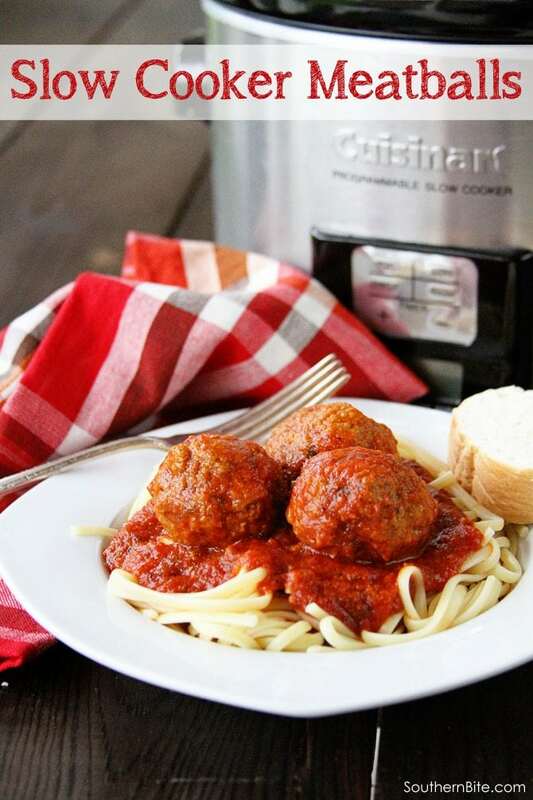 These Slow Cooker Meatballs are a great way to do just that. Pop them in the slow cooker in the morning and when you get home all you’ve got to do is boil some pasta and make a salad. You can even use these to make amazing meatballs sandwiches. So let’s get to making some meatballs, shall we? Here we have all our ingredients in one big bowl. Now, the first instinct is to just dive right in there and start squishing around. But, I’ve found that using a fork to “stir” everything together works better because it keeps the mixture from getting overworked. You’ll just need to make sure it’s all mixed well. 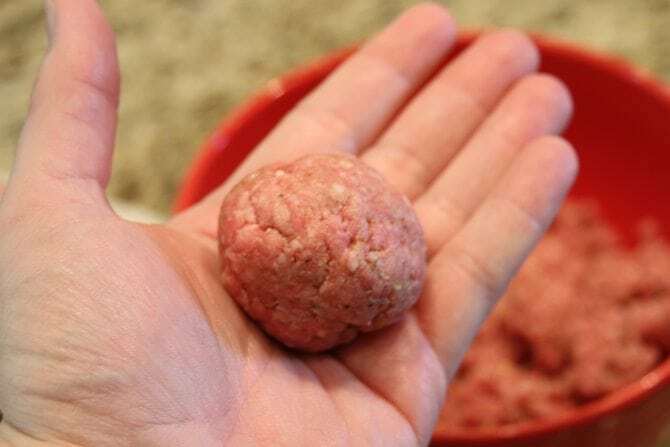 Scoop out about 1/4 cup of the meat mixture and roll it into a ball. I like to use a 1/4 cup cookie scoop for this. It’s keeps them all the same size. We’ve got one jar of the sauce in the slow cooker (that’s been sprayed with nonstick cooking spray -you’ll thank me when it’s clean-up time). Put the meatballs all in there and then top with the other jar of sauce. Then put the lid on it and cook on low for about 5 hours. There you have it! 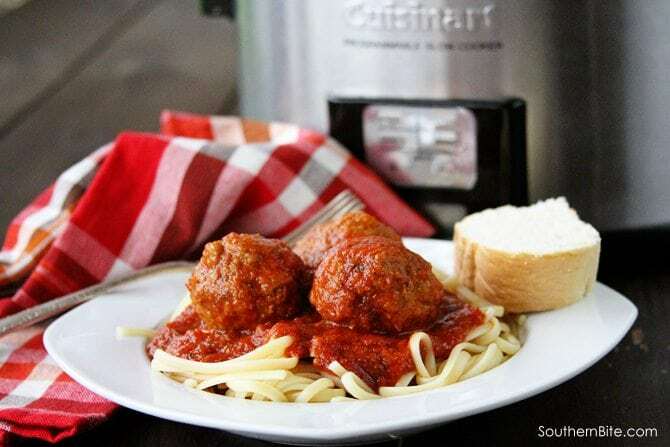 Delicious and EASY Slow Cooker Meatballs. 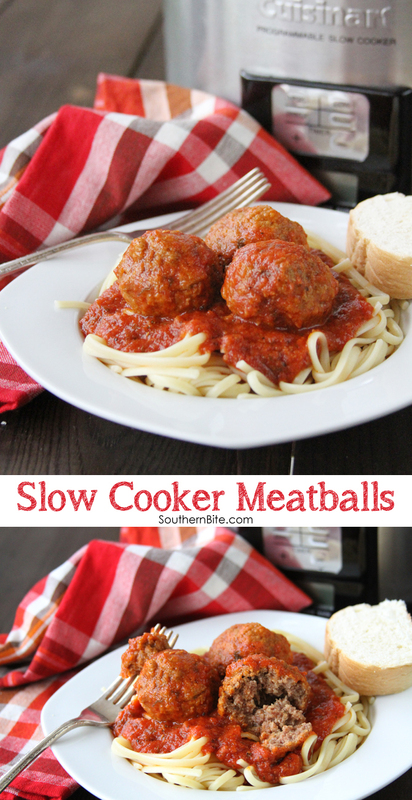 These are great served over pasta or even in a meatball sandwich! Lightly spray the crock of a slow cooker with nonstick cooking spray. Pour one jar of the sauce in the slow cooker. 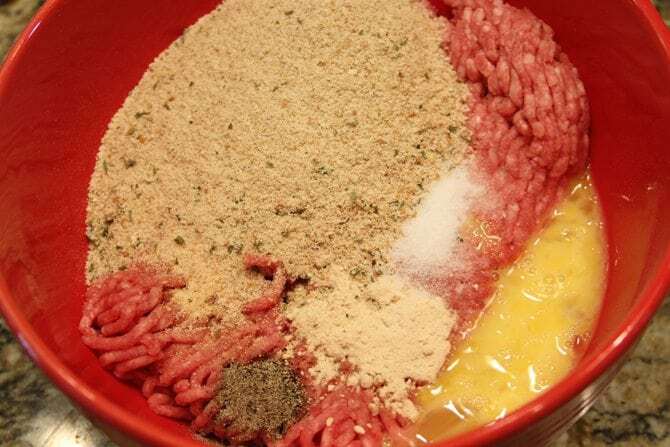 In a large bowl, combine the ground beef, egg, garlic powder, onion powder, bread crumbs, salt and black pepper. (I like to use a fork for this. It gets everything blended without overworking the mixture.) 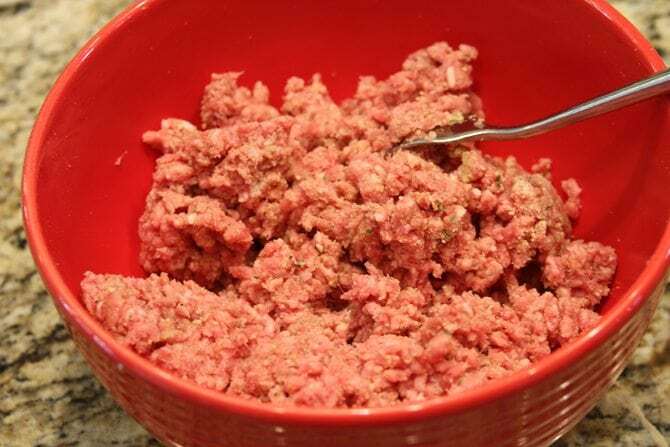 Scoop about 1/4 cup of the meat mixture and roll it into a ball. 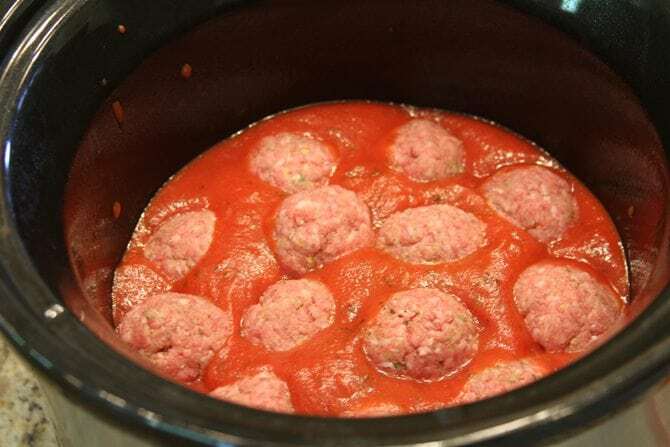 Place the meatball into the slow cooker on top of the sauce and repeat until all of the meat mixture has been formed into balls. Top with the other jar of sauce and cook covered on low for about 5 hours. YUM!!! Thank you for this wonderful sounding recipe!! I can’t wait to fix it this weekend!! These meatballs sound fantastic but my children (picky toddlers) will not eat meatballs that are covered in spaghetti sauce. Do you have any other suggestions on how to cook these in the slow cooker without using sauce? Thanks. They’ll need some type of liquid in the slow cooker – gravy even. I have a slow cooker that will brown and slow cook. Is it worth the time in a recipe like this to brown the meatballs for a minute or two? You are welcome to do that. It will certainly add another layer of flavor. Hi Stacey! 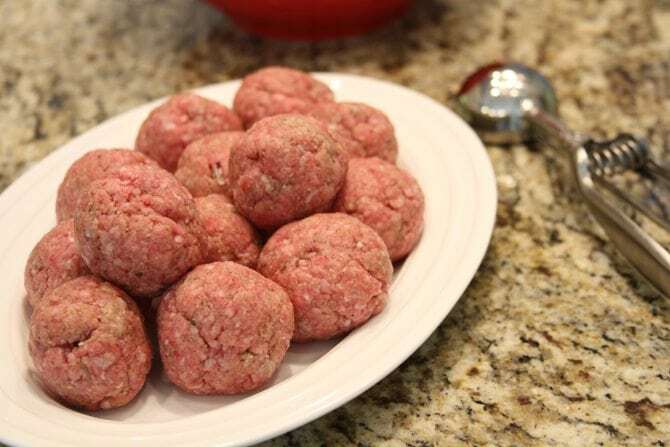 Just wondering–what type of ground beef do you recommend for the meatballs? i.e. ground chuck, sirloin, etc.? Thank you! I enjoy your blog and cookbook! With this recipe, I usually go as lean as I can. That way there’s not a lot of rendered fat. This looks good, Stacey. I’ll have to try it soon. Thanks. Lol, remember I told you that my mother liked your site, so I signed her up for your emails too? She mentioned this recipe to me today before I had a chance to check my emails. She was right, it looks good! By the way, I just left a review for your Simple Skillet Orange Chicken, which we had for dinner tonight. It was delicious and easy! Being very new to your site, that was the first recipe that I tried. But, I have a bunch more bookmarked and printed out. I’ll let you know when I try them, as I always appreciate reading others’ comments once they’ve tried a recipe. Seriously, I’m just tickled you and your Mom are finding so much you like, Samantha! 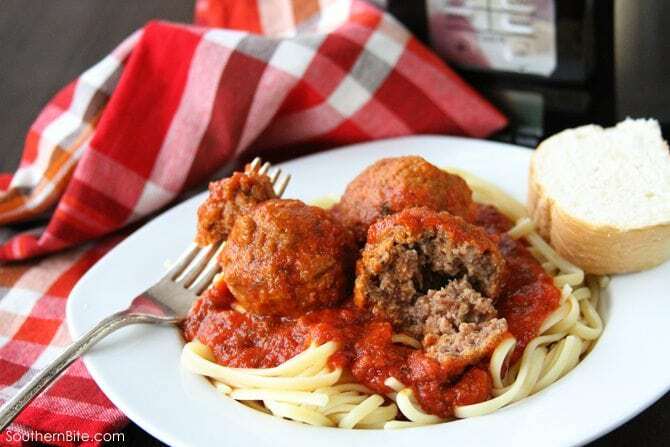 If you have not tried the meatballs yet you definitely need to try this recipe. I made it last week and making it again today. They melt in your mouth and oh, so tasty!! I added mushrooms and a can of rotel last week. I am going to add rotel, mushrooms and diced or stewed tomatoes this time. Also, using 3 pounds of hamburger so I can share w/ my sister again. She also loved it. That’s what is for dinner! Yum!! Stacey, thank you for all the wonderful recipes! Thanks so, so much, Laura!! I do think it’s a sign! Hope y’all enjoyed it!! What if I wanted to used two pounds of meat? Should I add an extra egg? More bread crumbs? No, I’d just keep all the other measurements the same. I made these last Saturday to use for meatball subs. They were devoured by my family! Very, very good and super easy to make. Beats the store bought frozen meatballs by leaps and bounds. Made the meatballs the night before and put them in the crockpot early Saturday morning. Excellent. Thanks for sharing a great recipe and method. Sounds great! Now you’ve got me craving a meatball sub! So glad y’all enjoyed them! Hi, would it be okay to make the meatballs smaller? If so, would that change the cooking time? Thank you. Absolutely! The cook time will be a little shorter. 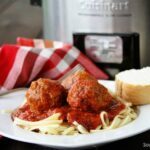 Made your crockpot meatballs and they turned out great!! Melt in your mouth meatballs! Thank you for the recipe. Yum!! That’s awesome, Laura! So glad they turned out great for you! Last week when I made these I use 2 pounds of meat but stuck to recipe w/ egg and bread crumbs. Today I am using 3 pounds of meat so do you think I should add an extra egg and extra bread crumbs? I would add some more bread crumbs and an extra egg, but it will work without them. Making these tonight for our Valentines Day Spaghetti Dinner! Sure hope y’all enjoy them!! Happy Valentine’s Day! Boy am I glad you are here! Humanity has been struggling for the past few millennia just waiting on a humble, selfless, benevolent person such as yourself to teach us the error of our ways and save us from our own self centeredness (not to mention meat grease). While I sympathize with the trials you had to endure after you clicked over to my page, being subjected to convenient links that would render more free recipes, I can’t help but feel that argument is moot since you did manage to make it all the way to the bottom of a post AND leave a comment. Kudos to you! Your kindness and concern for the rest of humanity is admirable and we look forward to more of your gracious instructions to us little people here on the web. Do you think ground turkey would turn out as well? Thank you for all the great recipes!